This article explains shopping and dining options at Omkareshwar, Madhya Pradesh as well as Tips. Hotel Vikas which is located just near the Bus Stand. Narmada Café which is located on the Mamleshwar Road. Aishwarya Restaurant which is located right opposite the Temple. This place is famous for special sweets like Jalebis, Rabdi and Gulab-Jamuns. One can expect a lot of shopping here with many shops and stalls lined all across the streets which surround the temple. 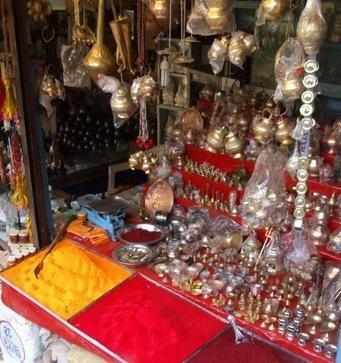 There is lot more to shop here with many shopping items including handcraft materials, small shivlingas in marble stone and wood, artefacts, religious items and much more. There are many sweet shops from where many authentic and local sweets can be bought. 1. There are two options for reaching the Omkar Mandhata Temple here. The ferry services are extremely convenient and one should go for it. But for people who don't wish to spend on the ferry services can take the bridge which is built over the Narmada River and reaches this temple. 2. There are few steps, a little steep which take you to this Temple. Climb them slowly and don't haste. 3. Don't forget to visit the Amareshwar Temple where the other half of the Shivlinga is placed. 4. Being a small town in itself, don't expect luxurious accommodation capacities here. But the Guest houses and the Ashrams also offer comfortable accommodation with basic amenities. 5. The Dharamshalas offer windowless accommodation and hence may not be very comfortable. But many pilgrims who visit in groups go for such accommodation as they are reasonable enough and can accommodate group bookings. 7. Pilgrims who don't take a ferry and wish to go for a dip in the holy water should try going towards the Sangam, the confluence point where the rivers meet. The water in this part is clear and safe due to less rockiness. 8. The parikrima that any religious Hindu would prefer taking around any temple is one of the most important aspect of visiting temples. The same way, a parikrima around the temple is said to fetch boons to the pilgrims and get rid of their sins. Do take a parikrima of the temple as apart from the above reason, the pleasure of walking around this shrine could also be a enthralling experience as the temple is located amidst perfect scenic set background. The Omkareshwar Parikrima is considered to be one of the Mokshdaayi and many people walk around the entire region which takes around 3 days. 9. There are many monkeys, approximately in thousands on the island of Mandhata. Hence be very careful of these monkeys who get a little excited when they see any eatables in your hands. A Vanar Bhojnalaya (food joint for Monkeys) is about to be constructed within the Campus of the Temple to resolve this problem. However you still need to be very careful. 10. Please don't litter around the temple area and the island of Mandhata. Try and keep the area clean.